This leather craft tools set total including 31 pcs leather sewing tools. Glovers needle, carpet needle, sail needle, straight upholstery needle, sack needle and 2 pieces of curved mattress needles. 30 days money-back , 12-month warranty. Any questions you have, please don't hesitate to contact us. If you like our product, click Add to Cart to get it. 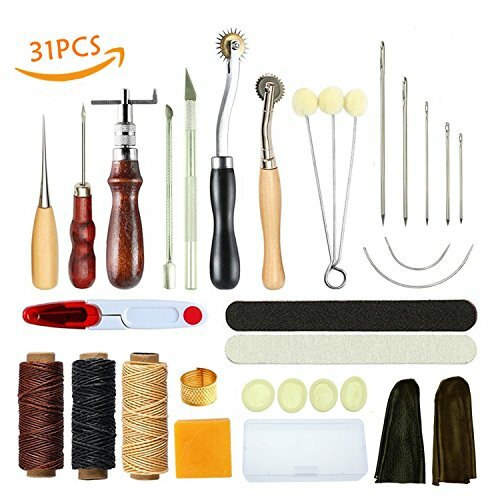 Leather kit includes: 31 PCS HAND STITCHING SET: This leather tools set includes 2pcs Pressure cloth tooth(4mm,2mm), 2 types of Awl, 3 colors threads, Adjustable groover, needle kit, Thimble, Beeswax, Leather Knife and Finger cots All tools are packed in a new transparent PVC box for easy access! DIY TOOLS: A kind of very easy to use DIY hand tool.Great for custom leather work such as sewing leather, canvas, cloth, paper or other projects. Includes two finger sleeves, two leather knuckles and four rubber cuffs. If you have any questions about this product by Vranky, contact us by completing and submitting the form below. If you are looking for a specif part number, please include it with your message.